Intel has been part of my life for a long time. Their company culture was always top line. While they face technology challenges with their new chips, I am not worried that INTC will go out of business. However, the stock has had a nice run and the summer doldrums are here. However, as an income investor INTC's dividend of just over 2.3% is not exactly compelling. 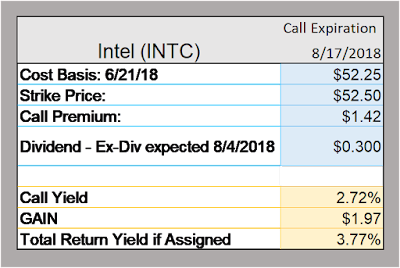 Before the news of Krzanich's resignation, I added to INTC on what I thought was weakness. June 21, I bought 128 shares at $52.25. 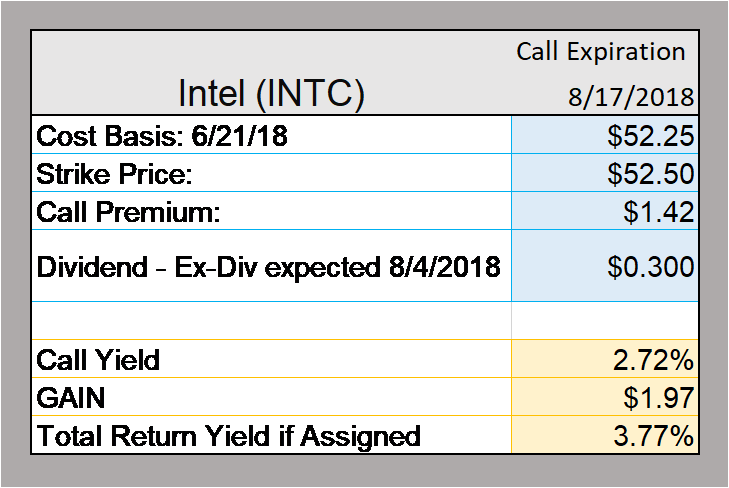 I reinvest INTC's dividend and I wanted to fill out a "lot" so that I could sell calls on 2 lots. While it seems counter-intuitive to sell calls when the market is selling off (right now the DOW is down over 400 points,) I wan to try to get my money back on that most recent buy. INTC is selling just above $50 today. I am selling a call on the reinvested shares and the 128 shares I added. This means I sold 2 contracts. I selected an expiration date after the next expected ex-dividend date of August 3, 2018. The best call I could find was $52.50 strike, with an expiration on 8/17/2018 and a premium of $1.42. The table below shows how it worked out. I don't really want to unload all my INTC. My cost basis on my other shares is under $20. If I have to keep the 200 shares with a cost basis of about $52, I will be getting the dividend. If they take my shares, I got a quick 3.77% gain in under a month. I can live with that.